I told you… glitter in my soul. 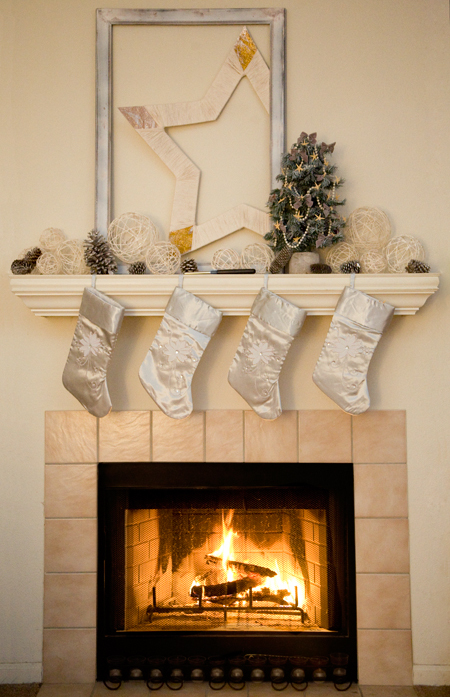 This is the Christmas mantel for 2012, carrying over the snow theme. I used only things I already had, save some extra glue and a bag of balloons. 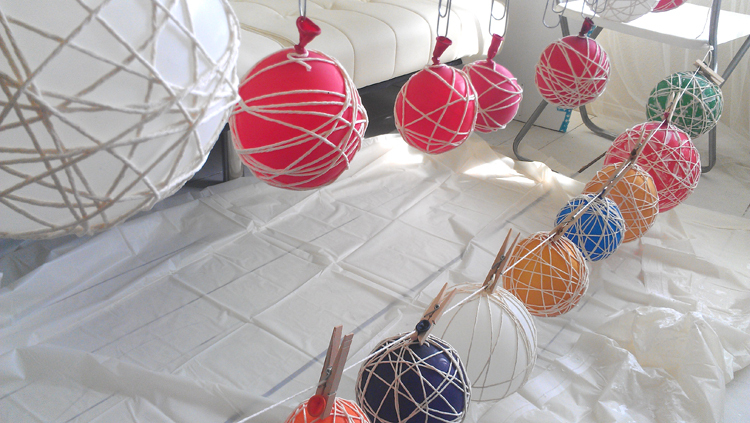 The snowballs are made from twine and glue, wrapped around blown-up balloons and dried (see the pics below). 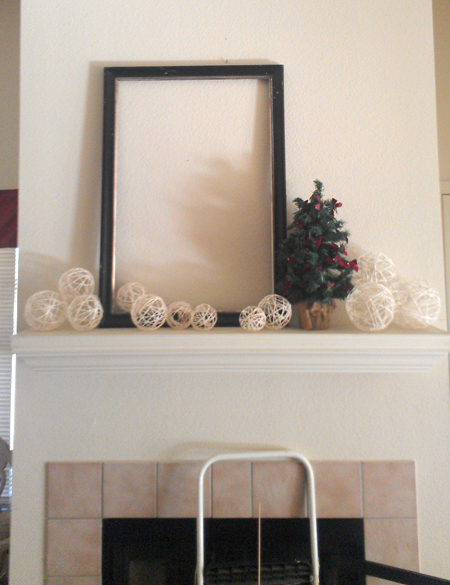 The little tree is one that I usually put outside. I lightly sprayed the tips of the branches with white spray paint to mimic snow and spray painted burgundy bows silver. The starfish are left over from the ocean tree a few years back. The base was originally wrapped in burlap and tied with a red bow; when I took that off, the cement base underneath worked perfectly with the silver and white color story. The large star inside the open frame is one I cut from foam core, glittered on the points and then wrapped with the same twine that makes up the snowballs. Man, were my arms sore after all that twine-wrapping! The frame was black, painted white and scuffed up with sandpaper. 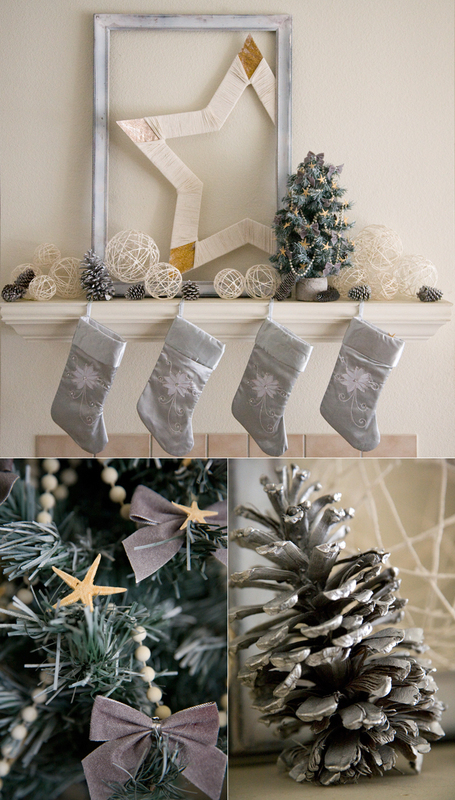 I took the silver spray paint to a bunch of pine cones and voilà! Done and done. All done with a cheery little fire- color me holiday happy!